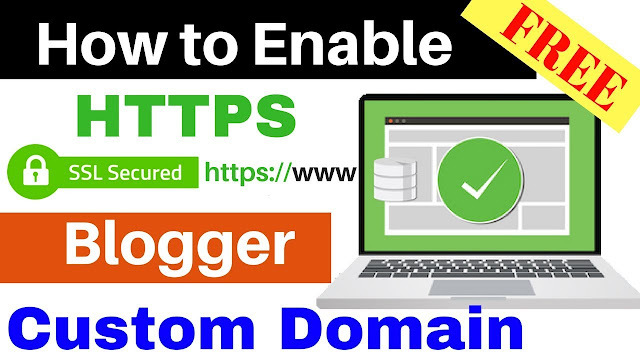 Manual on Blogger Custom Domains: How to enable the HTTPS SSL? Hello Techno Ganpat Friends: Friends will tell you today how to enable your 'Blogger Custom Domain Par HTTPS SSL? And how to use it and why. According to Google's new update, if HTTPS is not connected in any domain, then its blog will not be open in Chrome Browser, which will reduce your traffic to your website. One more thing today, the Google Chrome browser is growing fast today. Therefore, you should be ready for the coming time. What is HTTPS? And what are the benefits of using it on the blog? "Hyper Text Transfer Protocol Secure" has its full name. All your data remains encrypted, so that nobody else can read your data. No one can easily hack your blog. Your posts rank on top of search engines. All browsers support. Next Google Chrome browser will not support Http. Manual on Blogger Custom Domain: How to enable HTTPS SSL? Friends, as you know, blogger blogspot.com is a free service from Google, that means you do not have to do anything more, just follow some steps with me. Noteworthy thing: Friends do not make any mistake in enabling HTTPS service on your blog domain, otherwise your traffic will be reduced. First click Setting in your Blogger Dashboard. Now click on Setting Basic Settings option. Now click on "Yes" in front of the HTTPS Availability Option. And in the HTTPS Redirect option you also have to click on "Yes". Notice: Wait a while after applying the entire setting correctly. If you open your blog instantly, your blog will not be open. Friends, HTTPS Service has been activated on your blog too, it is also free. If you have any questions, please tell us by commenting in the comment box below, and if possible, please subscribe to this blog.